How to Find Your Dream Job: tips from those who've done it. This week I learnt that successful entrepreneurs try things out. But when you’re in a routine it’s easy to stay stuck in a rut and not venture out of the comfort zone. 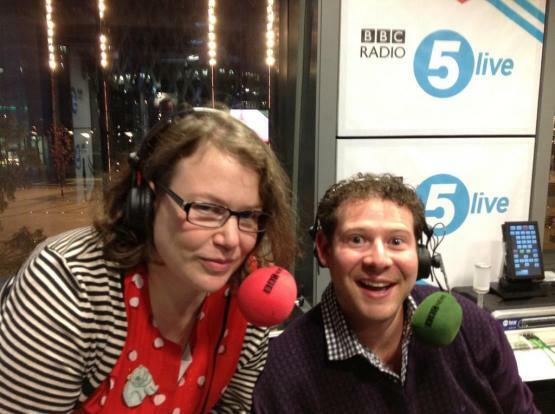 Helen Zaltzman and Olly Mann tried something new in their living room in 2007. Home broadcasting. They have gone on to have a regular show on BBC Radio 5 and won a Gold Sony Radio Academy Award for their weekly comedy podcast Answer Me This. It’s recorded in Helen’s house with nothing more than a phone and sometimes cooking smells. They’ve created over 200 podcasts featuring their ‘cerebral-juvenile ramblings’ and 120 of them can be bought for 79p. A regular feature includes ‘Bit of crap on the App’. Podcasting for Helen and Olly started out as their ‘crap hobby.’ Then they realised they were ‘crap’ at their ‘crap’ hobby. But by starting out they got better at it. With 10s of 1000s of listeners, Helen and Olly’s audience figures are now higher than some peak time radio shows. Video of Helen and Olly at Next Radio. This entry was posted in Dream Job, Inspiration and tagged Answer Me This, dream job, Helen, Helen and Olly, Helen Zaltzman, Helen Zaltzman and Olly Mann, inspiration, ITunes, Olly, Olly Mann, Podcast, podcasting, radio, top podcasts. Bookmark the permalink.